Johnston Hobbs is currently coaching baseball in Apex, NC, at Apex Friendship High School. From 2011-2016, Johnston served as Assistant Coach in charge of Catchers at Flanagan HS in Pembroke Pines, FL. Johnston moved to Fort Lauderdale in 2010 from Indianapolis, IN. After receiving his Master’s Degree in Kinesiology from Indiana in 1996, he coached at both The University of South Carolina and NC State University. He then successfully helped create and build the nations’ largest commercial Swimming Pool Management Company, PMG, managing over 800 facilities and providing over 3000 lifeguards in 16 cities nationwide and abroad. He now owns and operates Hoosier Pool Consultants and Hoosier Risk Mangement. Hobbs served as Assistant Director of Baseball Operations in 2011 at one of the nation’s premiere residential sports camps, Camp Greylock, in Beckett, Mass. Johnston worked with many of the top Indiana HS and collegiate catchers and pitchers in Indianapolis at the Indiana Baseball Academy during the winter. In 2003, Johnston was hired as a consultant for the Turkish Olympic Committee to help develop the Olympic sport of baseball and has worked with 6 individual Olympic Athletes, training them for Olympic competition. In 2004 and 2005, he served as a consultant for the NCAA in Mens Division 1 Championships. He has coached at University of Oregon’s Prospects Camps, TCU, and Indiana University’s camps. After being named the Bench Coach for the 2013 Glens Falls Golden Eagles in one of the nation’s Top 8 Collegiate Baseball leagues, the Perfect Game Collegiate League, Johnston was named Head Coach for the Golden Eagles for the 2014 season and in 2015 with the team under new ownership and a new name, the “Glens Falls Dragons”. 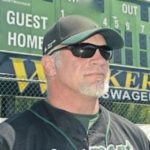 Johnston has coached with former MLB All Stars and pitchers on staff. In the 2016 season, Johnston managed the West Palm Sharks in the South Florida Collegiate League and in 2017 served as Manager of the Vermont Mountaineers in the NECBL. Johnston graduated from Southeast Guilford HS in Greensboro, NC. After HS, Johnston played for several Independent professional organizations as well as competed as a national caliber competitive swimmer. Johnston attended Indiana University, The University of North Carolina at Greensboro, and South Carolina University, graduating with a degree in English and Exercise Sport Science and a Masters in Sport Performance Psychology and Ed Psych. He holds black belts in several forms of martial arts and incorporates many principles into athletic training. Both his father and brother were high level pitchers in several baseball organizations. Johnston has been a speaker at many coaching clinics, demonstrating catching techniques and training strategies to coaches of all levels. He assisted with a presentation on Hitting at the 2012 BCA National Convention, presented at the 2015 BCA National Convention, the 2016 Massachusetts Baseball Coaches Clinic, presented at the 2016 Ohio Baseball Coaches Convention as well as the BCA National Convention, and again at the BCA in 2017. He also has traveled to speak at several Colleges and High Schools clubs across the country. After watching instructors for tireless hours teach the same drills over and over and over to every student alike, Johnston got the idea to start 224 Performance with the goal of giving elite level instruction in training, exercise, and strategy to facilitate increased performance and to increase each athlete’s value to their team/sport without having to spend thousands of dollars traveling across the country. 224 Performance has assembled an elite staff of coaches, trainers, physical therapists, physiotherapists, and Orthopedic Surgeons from across the country that provide a virtual coaching, educational, and training experience designed for each individual athlete with no limit to feedback. As one of the greatest athletes in the world, Bruce Lee, once said, “No limit is my only limit.” 224 clients will never be limited to feedback and instruction and will always be provided a program to help them evolve and maximize their talent and DNA. Johnston managed the West Palm Sharks in the South Florida Collegiate League, in 2017 served as Manager of the Vermont Mountaineers in the NECBL, and in 2018 managed The Nevegantes in Aguadilla, Puerto Rico.